This FUN stocking shows a snowman next to a birdhouse with a crow friend. 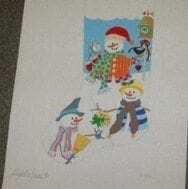 He has two other snowpeople friends coming to visit – another snowman and a snow woman with a basket of stars. This stocking has lots of fun bright colors and lots of places to try out new stitches and new fibers. I can imagine things to do with all those scarves! On 14 ct. there’s room for personalization at the top.